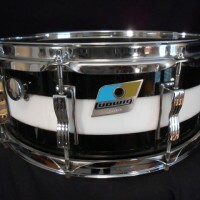 LUDWIG, 1970s BLK-WHT-BLK HORIZONTAL STRIPE VISTALITE, 5X14 Vistalite shell. 10 lugs. Serial #1976139, Excellent condition. Number #36 PRICE $595.00 More photos available. Serious offers considered. SINGLE CLICK PHOTO TO ENLARGE. 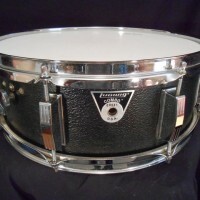 LUDWIG, 1970s, “LIGHTWEIGHT” PROTOTYPE, 5×14, ALL PLASTIC Ultra-rare proto-type drum. 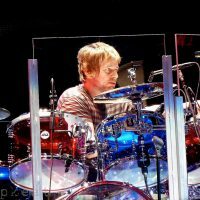 Designed for the school market as a super light weight drum. All plastic shell and lugs. Aluminum hoops. Serial #88641, One broken lug. Otherwise Excellent condition. NUMBER #30 PRICE $395.00 More photos available. Serious offers considered. SINGLE CLICK PHOTO TO ENLARGE.